Sally Yates. An American hero. There will be more. In the wars to protect the American dream of a righteous, compassionate nation, there have been heroes and there have been villains. Chicago Tribune: 1/31/2017: President Donald Trump fired Acting Attorney General Sally Yates Monday night, after Yates ordered Justice Department lawyers Monday not to defend his immigration order temporarily banning entry into the United States for citizens of seven Muslim-majority countries and refugees from around the world. 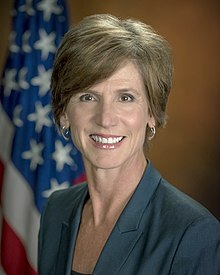 Sally Yates knew what would happen to her for her defiance of a leader who preached fear, a leader who would have us crouching behind a great wall, while innocent people of a religion are refused entry. Sally Yates rose one brave voice of protest, a small voice in the scheme of things, but an important voice. She follows in the tradition of our founders who defied the king and built America. There were heroes then. How many of us today would risk our jobs to defend our Constitution and the people and the religions it was designed to protect? Sally Yates is one who stepped forward. There were many more, and there will be many more, until cruelty and cowardice once again have been defeated by American compassion and courage. Godspeed Sally Yates. May your name long be celebrated.